Tim has been a hot rod guy from the early age of 10. I think it was a horse and buggy! He got his first car at 14, a ’47 Ford Tudor Sedan. To help with the running of a car and the running of the girls, Tim worked as a car-hop, will maybe that was a fry cook at Ron’s Drive-In in the Spokane Valley. Tim says the girls and rods were aplenty. 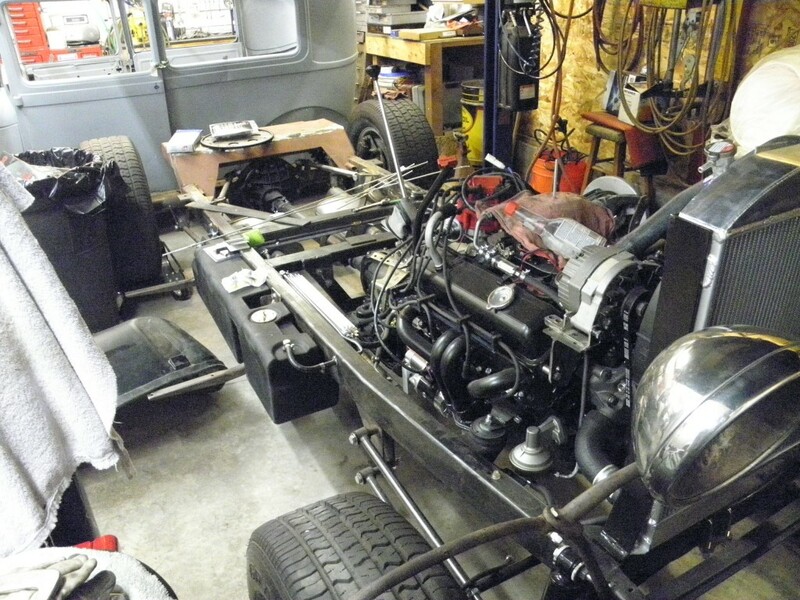 With the help of a few friends he bought and built a ’57 Chevy two door hard top, he was now 17. The fastest car that he has owned was a 383 Magnum Dodge Dart, with a four speed on the floor. 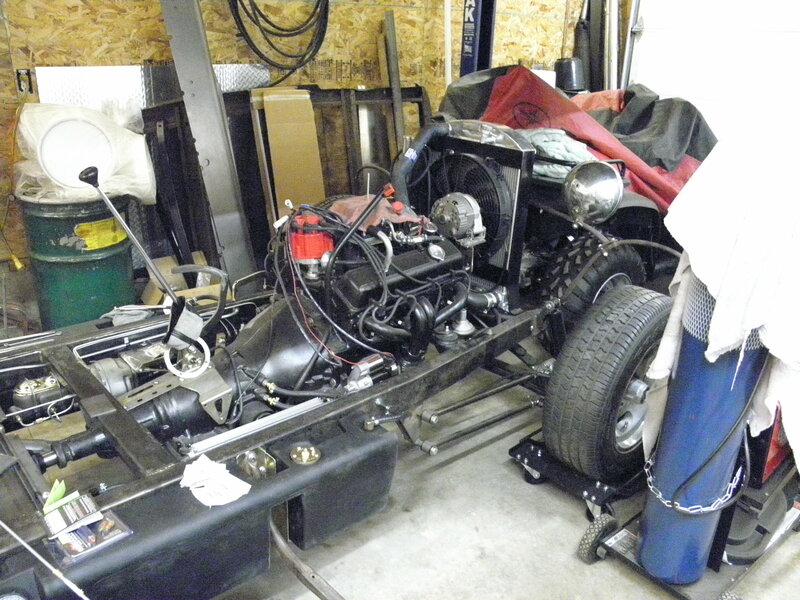 In ’64 or ’65 he and a friend built and raced a ’31 Ford Roadster with a Chevy 283 as the go power. They raced it at the old Deer Park Drag strip in Deer Park, Tim said it was very competitive Rod. He has had many Rods over the years and has been showing them around this area since ’86. In the ’60’s a car club was formed in Sandpoint called the Injectors, it had quite a few local boys and some of their fathers that helped them get everything set up and going. It seemed to fade away as the Boys got older and got married or moved away, so the club went under. In 1999 Tim with Jim Neveau, Dave Townsend, and Bill Zantow, while sitting eating some Burgers at Burger King, and kicking things around, one of them said lets start up a car club. They all agreed that it was a great idea, so a name was the next order of business. That’s when Bill tossed in his two cents. Why not name it after the old car club from way back when The Injectors? So they did! Tim has been working hard on his new project. He started off with a frame that he got from a club member, Arne Kantola, a lot of work as been done to it and it is close to being done. Tim has stepped the back end 4″ and rigged up a nice nine inch Ford from a Mavrick. To keep it from being to bouncy he has installed some nice Coil overs. The trans is 700 R four with a 2500 stall, and a Locar shifter to put it thru the gears. Tim did all the cutting and welding where needed. As you can see he added some 8 gallon bags under each running board. A switch inside well keep the gas flowing. The front end has a 4” BEll dropped front axle, four bar. Linking it to the frame. He plans on running a set of steel rims or Artilary rims with big and little tires. The engine is going to be a built chevy 350. It will have a Comp cam, flat top pistons, 305 Heads and roller top rockers. The gas will go through an Edelbrock carb on an Edelbrock intake. The exhaust will funnel thru a set of Herman headers. Tim has a plan or has already powder coated the engine. A Aluminum four row Rad will be put into service to keep this one cool Rod. The body has some surprises in store for it. 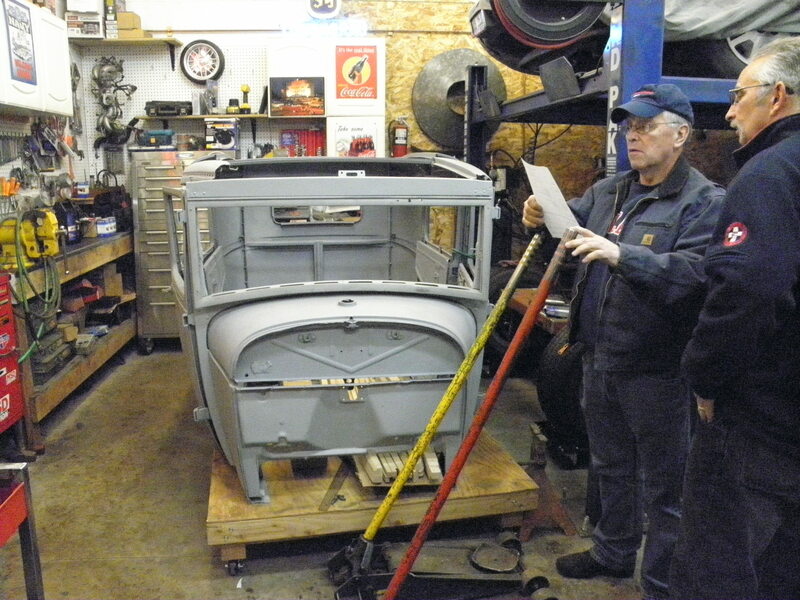 Tim plans on unbolting the back section and bolting on a fiberglass panel section in its place. 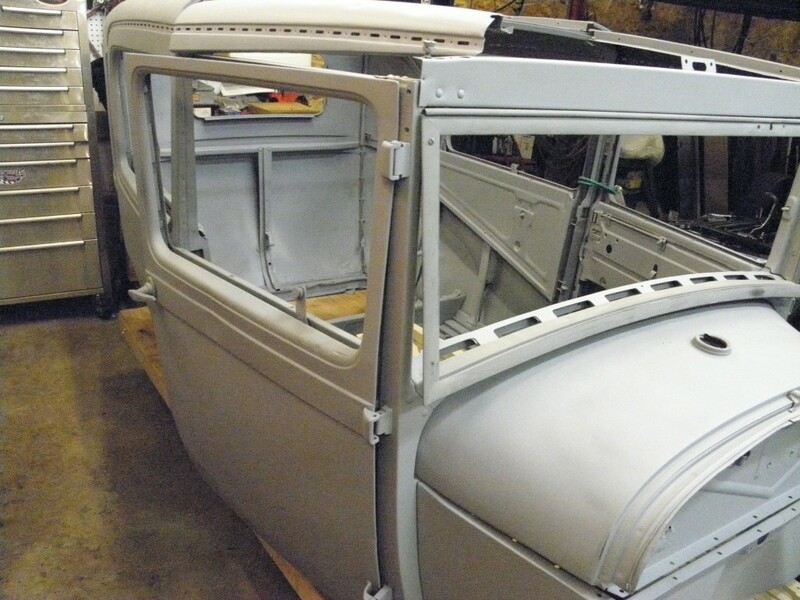 It will have a door in back and the two back windows will no longer be there, sounds good. In other words it will be a panel! He has some nasty rust spots on the back lower panels that have to be taken care of, you know the kind, like it was shot with a shotgun! He plans on applying some type of patch panel, one of the ideas is to apply a fiberglass patch, another is to use a panel glue and a metal sheet of tin. These are being used instead of wielding to keep the panels from warping from the heat. Tim has not decided on a hard or soft top. And of course the rig has to be red, but that is down the road. This is going to be a great ride when done, and Tim is doing a great job. Keep up the good work Tim and Rod on.